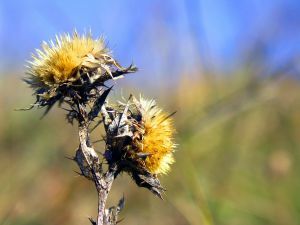 �Carduus Benedictus.�This plant is anative of the warmer countries, and is raised with us in gar- dens. It is two feet high; the stalk is reddish, slender, and weak; very much branched, and scarce able to keep upright under the weight of leaves and heads. The leaves are long, narrow, cut in on both sides, and of an obscure green, The flowers are yellow; they stand in a kind of green leafy heads : the little leaves composing these heads are prickly; and each of the cups of the flowers ends in a long brown spine, dented on both sides. �It is bitter and stomachic. An infusion of it taken in large quantities, will excite vomiting : in smaller draughts, it is good to create an appetite, and prevents sickness and retchings. The leaves dried and powdered, are good against worms. It was at one time supposed to possess very great virtues against fevers of all kinds : but that is now disregarded.